7 p.m., Price Point Inn, Bluemound Rd., across from the Waukesha Airport. Please help spread the word to all family and friends who either attended or worked there. I drive past the school every afternoon for home. Thank you for preserving the building and making it your home. I had attended Quarry school and was the last class for Mrs. Johnson. My 1st grade. Then we had Mrs. Holsinger for 2nd grade and 1st grade for my sister Peggy and cousin Barbara. class was the 1st grade at the new school. I believe while in 1st grade (Gwen Ruben?) was practice teaching. My dad Robert (Bob) and his sisters (Bernice and Marcella) attended Quarry school in the 1920’s and 1930’s. We couldn’t be more confident that the Telechron 1F312 clock we just purchased off ebay is the right accessory for the Quarry School. 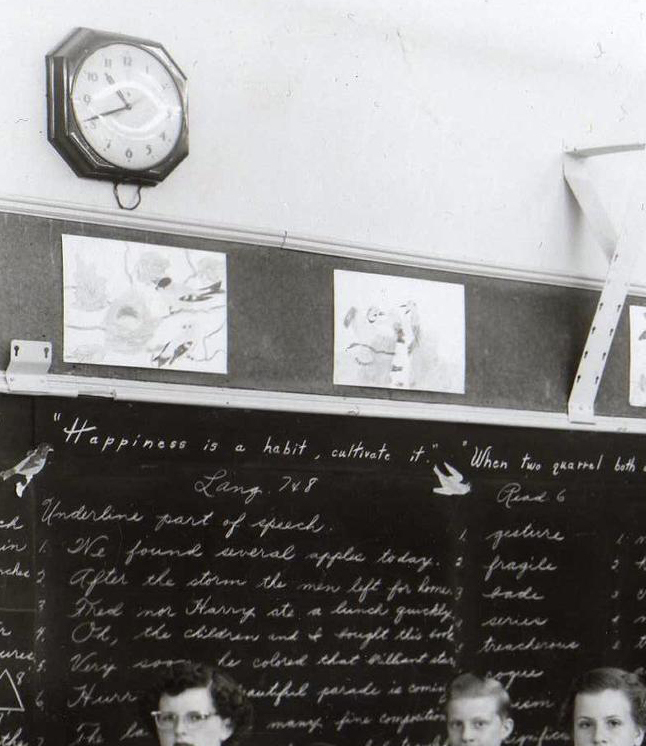 This model was widely used in schools beginning in the 1930s, and an eastern classroom photo from 1955 shows one reading 10:41 a.m. Although we do not have a photo of the clock that hung in the western classroom, its shadow can still be seen on an untreated wall (bottom photo). We’ve located our “new” clock on the wall opposite its original location because it suits our current-day use of the room, however, when the school was in use, students were always seated with their left shoulders to the windows (this put natural light on the desktops of right-handed students), and the clock would have been visible to them on the western wall. Does anyone remember watching this style of clock? As you can see from the to-do list on the original blackboards, our renovation’s not yet complete. We were living on SS across from where the gun club is now. My dad built the house. We had to walk from there all the way to the Quarry School. It took us about an hour. In the wintertime, we had to climb the snowbanks. In the summer, we would take a shortcut through the farmer’s field. I attended the first to the fourth grade at the Quarry School. The lower grades were held in the Little Room. My teacher’s name was Iva Graf. The Little Room had south-facing windows, and I think there was a one big light that hung down in the middle of the room. [In 1948 flores­cent lights were installed.] There was a stove in back of the class by the girls’ cloakroom, and the coal was stored in a box outside the back of the school near the girls’ outhouse. You could go through the girls’ cloakroom to get outside to get some coal. A stage that was used during Christmastime was kept in the basement. When set up, it measured about 12 feet by 12 feet and was set up on saw horses in the Little Room. At that time, the basement had a dirt floor. The area under the Little Room was never dug out. I had a summer job at the Beck’s Mill in 1937. Beck’s Mill was run by water power until the dam washed out. When I worked there, it was run by a 25-horsepower electric motor that was located downstairs of the building. Besides flour, we also ground up feed for cattle and chickens, and put it in 100-pound bags. To grind the wheat, Louis had to sharpen or dress the millstone, which measured about 3 feet from edge to edge. Mr. Beck had a nice garden, and he always gave me a bag of stuff to take home at the end of the day. He had chickens and a chicken house by the mill, and across the street he kept a cow for milk. Louis would cut the hay that grew along the road just south of the mill. He would cut it all by hand with a scythe. We stored it in the barn across the street and fed it to the horses while they waited for flour or feed. A shelter was provided for horses and wagons next to the hay barn. I think there was an old car in the mill when they burned it down. The floorboards of the building were bad, and after the mill shut down, the rats took over. 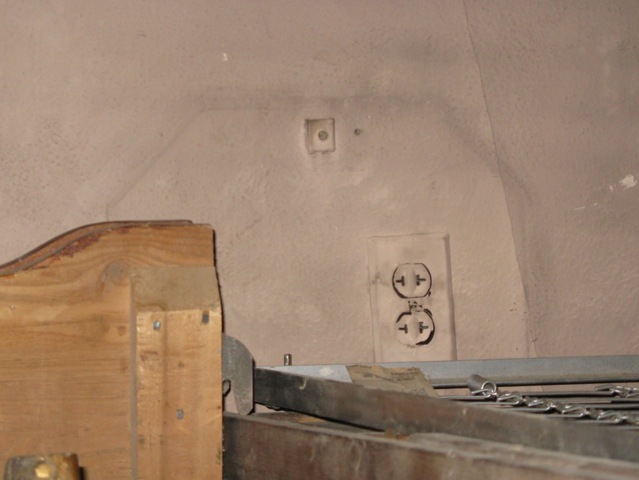 Only the limestone foundation and the chimney remain in 1999. We would watch them work in the quarry. There would be 10 to 12 wagons with two horses on a wagon, and they would be lined up by the shovel getting loaded. They had dump wagons that opened up and unloaded right into the grinder. There was a guy there who was a Greek, and we would tease him. He had a horse on a two-wheel wagon. We would get him so mad he would chase us out of the horse barn. It looks like there was another structure next to the quarry horse barn. You can still see the foundation. The person who took care of the horses might have lived there. During WWI the quarry had a big fire, and some buildings burned down. The schoolhouse was spared. Herzog had a milk route back in 1929. He delivered milk in the city of Waukesha. They were located across the road from the school between the Soo line and the Milwaukee road. The Wonderland Tap was run by an Italian lady. She had a little farm up the road from the tavern. The transition from horses to cars occurred around that time. My dad was a mailman, and he had a Model T. Erwin (Pinky) Beck had a yellow Ford Model A with a rumble seat. I think Caroline Beck had a convertible.